Navratri – a nine-night/ten-day festival is celebrated across India during the month of March/April and September/October. It is a festival celebrated across homes and there is a practice of immersing the puja materials into the river/water body on the completion of the festivities on the 8th and 9th day. The puja materials contain a mix of biodegradable and non-biodegradable substances which find its way into the water bodies mainly in plastic bags. Moradabad, a town situated on the bank of River Ramganga celebrates Navrati with great fervor. As a consequence, the Ramganga, a river that faces threat from low flows and pollution, also received a large volume of Puja offering during the Navrati festival. WWF-India’s ‘’Ramganga for Life, Life for Ramganga’’ Campaign has been working with citizens of Moradabad on various aspect of river conservation. From building awareness on the state of the river and the impact of our activities, to engaging with different stakeholders in seeking their participation, the campaign has been able to galvanize individual and community action for Ramganga conservation. While doing so we have worked closely with the government departments and district administration. March 24, 2018 saw the beginning of the #GiveUp Single-Use Plastics campaign in Moradabad launched as part of the annual Earth Hour celebrations. This year, the Earth Hour coincided with the bi-annual Navratri celebrations. Our efforts during Navratri in the past 2 years was to create designated sites for disposal of puja materials on the bank of the river in association with the Nagar Nigam and involve Ramganga Mitras and Civil Defense volunteers to sensitize citizens. This year, we expanded the partnership to include Home Guards, Parivartha-The Change - a volunteer based organization and the temple administration. This began with strengthening of enforcement along with building awareness. The initiative resulted in the collection of three tonnes of harmful material which otherwise would have entered the river. Following up on the launch of the #GiveUp campaign, we made efforts to reach out to the households. The first step was to train people who would act as volunteers and spread the message to the households. Ramganga Mitras led the way and were the first group to be trained. Training programmes were carried out with 300 home guards, 100 Civil Defense volunteers, officials and employees of Nagar Nigam Moradabad, Women Club, Schools and Colleges. With 700 trained citizens who were now willing to work as volunteers, we embarked on the mission to reach out to households across the city. Given the success of the initiative at the Kali Devi Temple on the banks of the river, we planned to reach out to the heads of various religious institutions and sects to engage them as partners to further our mission. We realized that if religious leaders endorse the need to #GiveUp plastics, the followers will abide and this would lead to a significant transition. On June 5 2018, WWF-India, in partnership with the Nagar Nigam Moradabad, organized a consultation involving religious leaders. They committed to reduce use of single-use plastics in their institutions and also to urge their followers to do the same. 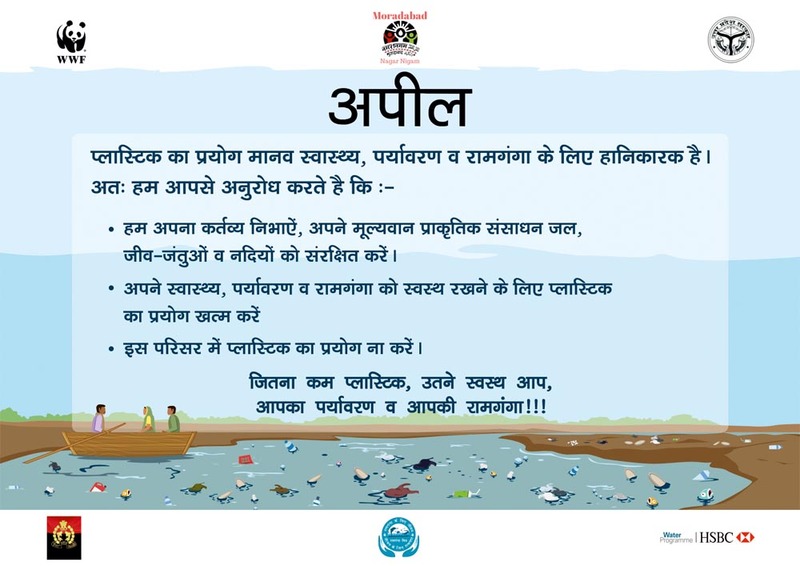 Subsequently, a joint appeal was released by Nagar Nigam Moradabad and WWF–India urging citizens to give up the use of plastic to save River Ramganga. The management of various temples, churches, gurudwaras, priests and other religious leaders made their efforts to translate the message to the devotes and followers by holding special meetings during the Friday namaz in the mosques, Sunday mass in the churches and meetings in the temples. People were informed about the growing problem of plastics in the city, the long term negative impacts on the environment and urged the devotes to use alternate materials. Some of the institutions issued instructions on the letter heads and pasted in their compound. Meanwhile, household activations by Ramganga Mitras, Home Guards and volunteers of Parivartan-The Change have contributed and we have been able to reach out to more than 2500 households in a direct manner. In our journey, we came across inspiring shopkeepers who have now eliminated the use of plastic plates, spoons and straws and have replaced them with alternatives. In the run-up to the Navratri celebration in October 2018, we deiced to work with the temple association and the market and trader association to prevent the use of plastic materials including carry bags in the shops selling puja materials. This was in addition to the household engagement that we have been engaged in as part of the sensitization efforts. Shopkeepers, citizens and traders were sensitized through nukkad nataks, individual and group discussions. 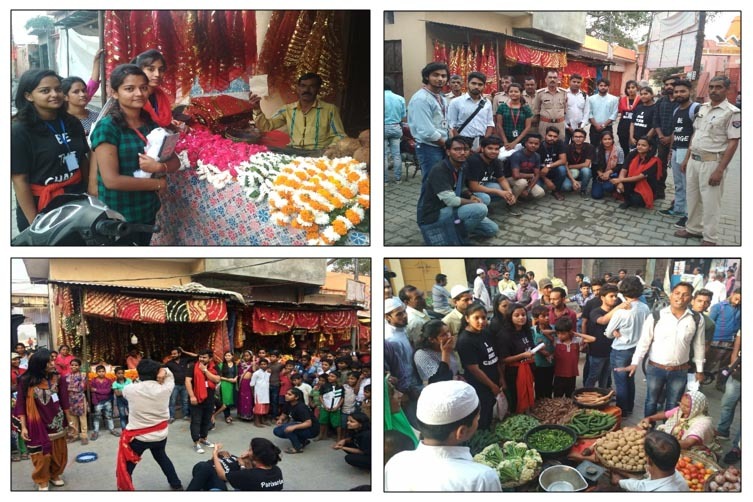 A special team of volunteers from Parivartan-The Change and Home Guards carried out regular vigil to see that shops do not keep plastic bags and materials in their shops. We are supported by the officials of the Nagar Nigam who ensured that there were mechanisms to dispose solid waste in dustbins and regular collection and cleaning up of dustbins. In October 2018, we have seen a 50% reduction in the amount of materials being brought by the citizens for immersion in Ramaganga during the Navratri season. For people who came to the river bank, we were able to direct them to disposing their materials in the dedicated pits. While this is a good sign, we realize that we have to sustain the momentum and keep engaging with people. Ramganga Mitras are planning jan-sunwai (public hearing) with their local municipal councilor to strength the waste segregation and collection efforts at their ward level. We plan to work with the Nagar Nigam to build capacities of the ward level committees named as Paryavaran Protsahan evam Swachatta Samities who have been entrusted with the mandate of building awareness on solid waste management and environment conservation in all the municipal wards of Moradabad. When we began the journey, we realized that making the change would be challenging but the efforts of the stakeholders have been heartening. It gives us hope that we will be able to make a difference which will be doing out bit to save the Ramganga!